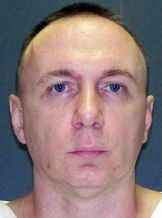 Donnie Lee Roberts, Jr., was executed by the state of Texas on October 31, 2012. Donnie was pronounced dead at 6:39 pm CDT, inside the Walls Unit execution chamber at the Huntsville State Penitentiary in Huntsville, Texas. Donnie was 41 years of age. He was executed for the October 15, 2003, robbery and murder of his 44-year-old girlfriend, Vickie Bowen, with whom he was living in her Lake Livingston, Texas home. Donnie was frequently abused and neglected during his childhood. He became dependent upon alcohol and cocaine. At the time of the murder Donnie was unemployed, although he had previously worked as a builder and laborer. Please pray for peace and healing for the family of Vickie. Please pray for Donnie’s family. Donnie mentioned God in his final statement.